Worn only once at my wedding in and in very good condition. 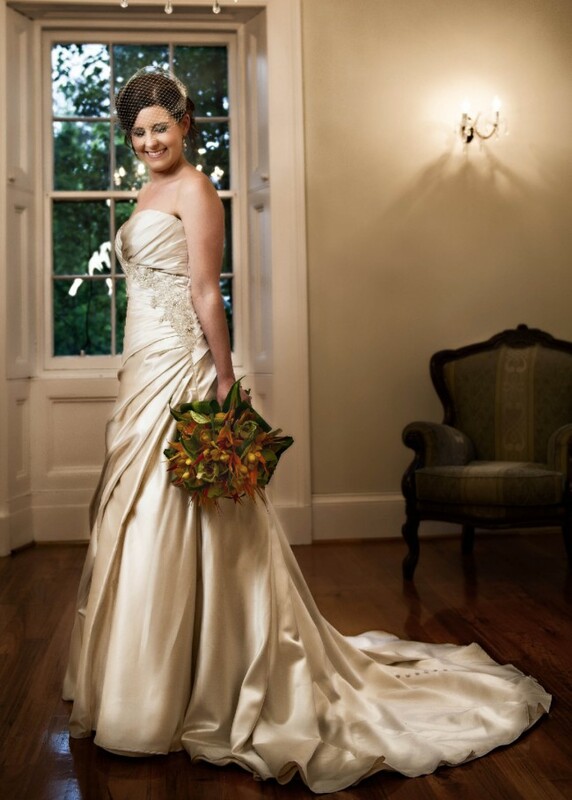 Dress was professionally dry cleaned immediately after being worn with no stains or markings. Dress is a beautiful champagne/pearl coloured gown, strapless with a sweetheart neckline and gathered to the left side with beading. Beading also accentuates the top of the back. It has a lace-up back with buttons continuing down the train to the floor. The bodice has boning throughout the back and the front, making it a very comfortable dress which creates a streamline appearance of the upper body. The dress is a size 10, however the lace-up back can be adjusted to all different body types. I am usually a size 10 but I wore it with a corset and it was laced quite tight so it would probably fit a body size 8 - 12, possibly even size 14. The dress has been hemmed to my height of 160cm with 2.5inch shoes. A bustle has also been incorporated so the train can be pinned up. Dress was purchased at $2500, selling dress for $750 ONO. Bustle added. Modesty panel included in lace-up back.